Some can not live with them, but we all can not live without them. There are too many of us, and too few of them. And with all the pesticides, that are used for practically ánything growing, the destruction of natural habitat and the climate change, bees are in danger. Check the website of Natural Living Ideas to learn more about the things you can do. And no, Eco-u is not a big fan of beekeeping when it is done like it is sometimes done with honeybees. Those important creatures deserve more than to be bought as a product to produce honey. Ofcourse there are some who keep bees in a respectfully and useful way so do your research before you buy! So what is so special about bees and why are they so important to us? Well, let’s start with a picture of a with and without bees. Shocking right? Well, it is just a picture. But the fact is, without bees the world would be a totally different place. “Apart from giving us an opportunity to consume a quality product, bees are among the major pollinators of about half of the plant species on the planet. A world without bees is literally a world without fruit, vegetables, nuts and seeds. And the lack of honey would be the least of humanity’s problems. So yes! 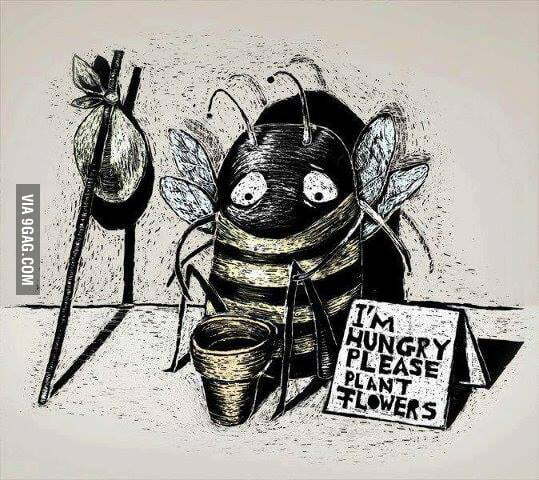 We need bees and yes! We want to help them.